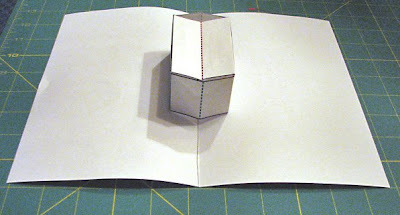 This is Lesson 19 in a series of step by step tutorials on How to Make Pop Ups. 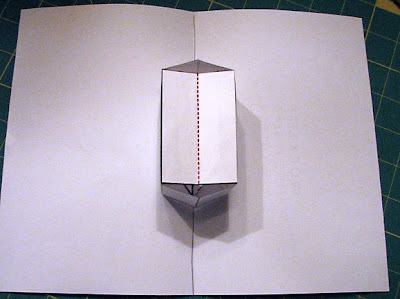 A five sided box (one side is the top) that forms when the card is opened out completely flat, 180°. 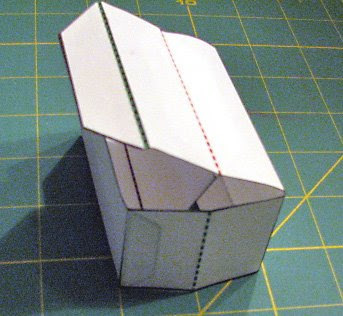 The box will unfold a little better on the sides than the Open Box from Lesson 18, because there is a hidden prop inside to support the shape. Print template or draw your own pattern. You can make your box either square or rectangular. Templates are designed to print on 8.5" by 11" sheets of paper. Finished box size is 3" length by 2" width by 1.5" tall. Box and prop to cut out. 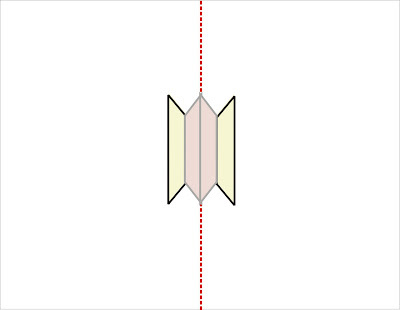 Schematic showing tabs and corresponding glue points. 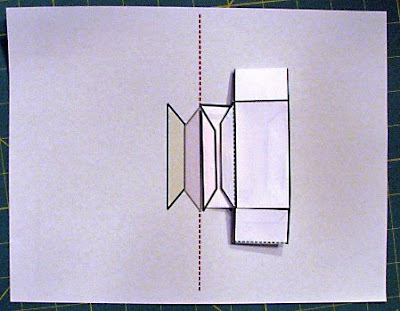 Glue schematic for affixing box to card. Black lines are cutting lines. Green lines are mountain folds, red lines are valley folds. Cut out, score and fold. 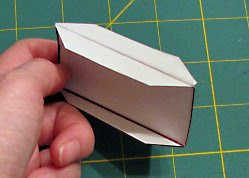 Fold and unfold the four tabs of the inside support (prop). 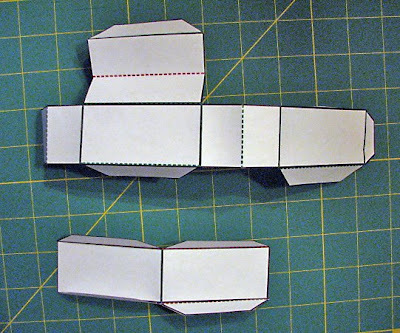 Fold prop in half and unfold. 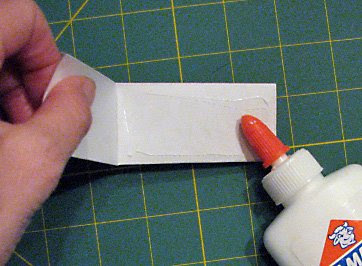 Spread glue on one rectangle. Do NOT put glue on any of the four tabs. 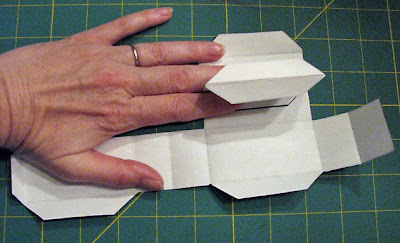 Glue the prop by re-folding it in half, pushing the tabs toward the outside to keep them unglued. 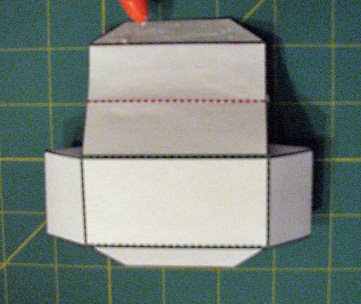 Glue one set of prop tabs (shown as gray tabs on Schematic) to inside of box top, aligning center fold line of box top with fold line of the tabs. 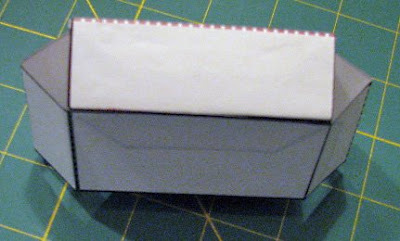 Glue small (blue) tab to short end to form box shape. 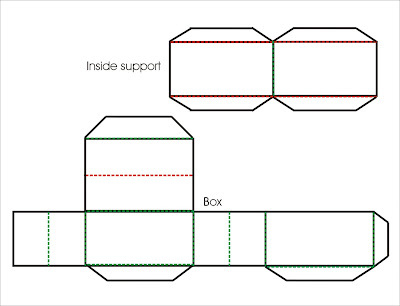 Glue tab on top of box (green) to inside of one long side, closing the top of the box. Push in the fold on the box top until the prop tabs (orange) emerge from the open bottom of the box. Bottom view showing prop tabs. 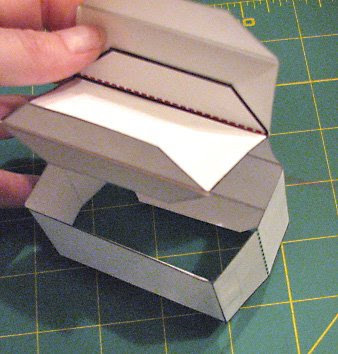 In this pop up card design the box tabs are glued under, toward the inside of the box. If you prefer, you can glue the tabs toward the outside of the box or slit the card base and slip the tabs through, gluing to the outside of the card. 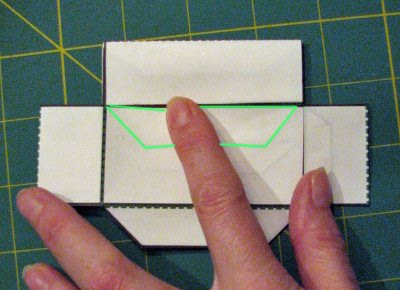 See Lesson 5 for more detailed coverage of tab and slot attachments. Flatten box. The top of the box is pushed down, with the prop tabs extending out the bottom of the box. 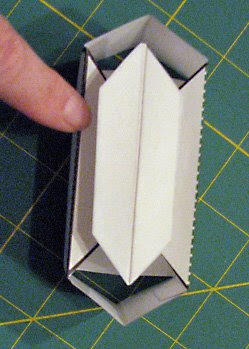 The sides of the box fold in half, toward the outside. Make sure the prop tabs extending out of the bottom of the box (orange) are pushed up toward the box top. 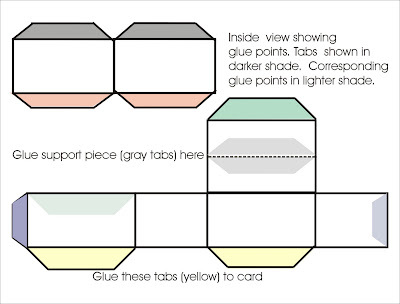 The box tabs (yellow) should be unfolded flat. You will glue one side of the box at a time. With box flattened, you will see one prop tab and one box tab. Apply glue to these two tabs. 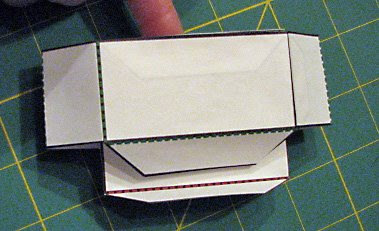 With glue sides up, lay box on card, aligning prop tab fold and card fold. 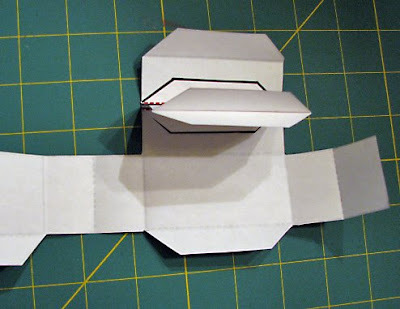 Close the card, applying slight pressure on the flattened box to keep it pushed into the fold. Allow glue to set up a bit. Flip card over and open. Apply glue to prop tab and box tab on the other side. Close card and allow to dry.